The BIOSCOPE is easy to use. By integrated 3-point electrodes the ECG can be detected on the patient’s chest. By using the cable adapter it is possible to use a patient cable. There is a memory capacity of up to 11 minutes and the stored information can be retrieved by displaying it on the screen of the BIOSCOPE. By means of an optional analog adapter (BIOSCOPE-AI) or a digital adapter (BIOSCOPE-DI) respectively the stored ECG can be transmitted to an external ECG recorder or to a PC. In the later case the software BIOTREND features extended analysis functions. 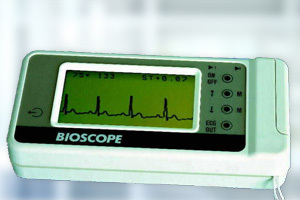 The BIOSCOPE-C is also used in our Anaesthesia Monitor BIO-3. Currently not available! The service for BIOSCOPE-C is continued.